It’s the Saturday after Thanksgiving at 9:00 a.m., and there’s a weather alert for a severe wind and storm watch. With minimal staff and the retirement community’s director out of town, what should be done? Wesley Homes Lea Hill residents at the command center. Lea Hill is one of the safest places to be in the event of a disaster. Members of the Wesley Homes Lea Hill Community Emergency Response Team (CERT) volunteers sprang into action during this weather alert simulation that involved both residents and staff. A nurse in the Lea Hill Rehabilitation & Care Center became the Incident Commander, the person in charge of the on-scene response until public agencies arrive. The resident CERT group was the main response force. The campus then received a storm warning. Approximately 10 minutes later, the campus lost power. 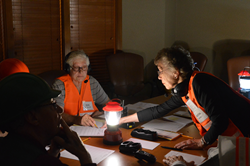 With emergency lanterns, the resident response team established a command center around a conference table in a dark office. The CERT group is comprised of several sub-groups: Operations, Logistics, First Aid, Trauma and Safety & Structure. The team worked to get the backup power up and running. “This exercise was designed to challenge our preparedness, to give us an opportunity to utilize our training, so we actually load tested the backup generators during the simulation,” said Wesley Homes Lea Hill Executive Director Greg Byrge, who helped oversee the drill. 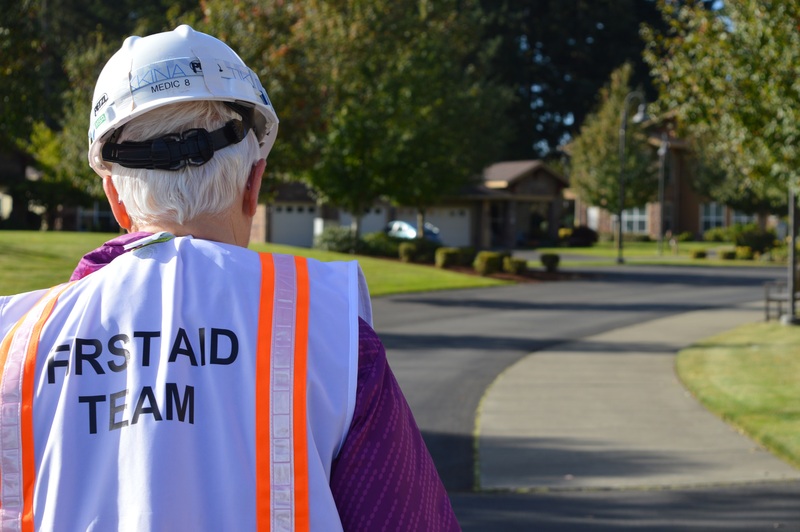 The drill was administered by Auburn Emergency Management (AEM), which provides generalized disaster preparedness training to community groups and organizations. Residents and staff were told the AEM team would inject a variety of incidents into the exercise to test the campus’s emergency response. It’s standard procedure to dial 911 during an emergency. In the simulation, Auburn's estimated response time was at least one hour. The front desk staff prioritized internal phone calls and became a key component for relaying urgent information between everyone on campus and the CERT command center. A visitor experiencing chest pain. The resident First Aid team was dispatched to aid the visitor. Two downed trees, one of which fell onto part of the building. After each tree fall, the command center dispatched appropriate response teams, such as First Aid and Safety & Structure. The teams evacuated the “damaged” apartment, provided any necessary medical aid and assessed the extent of the damage. All of this was then reported back to the command center. To simulate the potential chaos during a real disaster and test how response teams should prioritize calls and events, the team also received less urgent calls, including a call from a resident who asked if lunch would still be served. Jerry Thorson, the Auburn Emergency Management Manager who led the drill, said the campus’ responsiveness is far beyond what he’s used to seeing. “I was very impressed with the response. It’s rare to see a community this well prepared,” said Thorson. Thorson also said this drill was unique because the response team consisted mostly of residents rather than just staff. He was also impressed by Wesley Homes Lea Hill’s dedication to response efforts. Seven years ago, after an evaluation of safety measures and of the campus’s ability to respond to disasters, residents and staff took the CERT course. They realized that they needed responders for times when there were not many staff members on hand. The group is now 60 members strong. Their hard work paid off when they were honored with the Executive’s Award for Community Preparedness in 2012. “Greg and the Lea Hill management have been very supportive and engaged. This level of leadership really facilitates our efforts to train people on emergency response and disaster preparedness,” said Thorson. CERT members were analytical of their performance, concentrating on ways they could improve. Other residents expressed gratitude for the CERT drill and felt reassured in their safety. CERT is free to the public and involves classroom education and hands-on training in disaster preparedness, emergency management, fire safety, first aid and more. For more information, visit ready.gov.